Mussels are among the most flavorful ‘fruits of the sea’ and these Lemongrass-Coconut Steamed Mussels are plump, succulent and delicious. They are steamed in an awesome Asian-style broth of lemongrass, coconut milk and Thai basil. Thai basil is a dark green basil with purple stems and flowers buds. The leaves are narrow and have a distinctive anise flavor. Thai basil is used extensively in the Southeast Asian cuisine and adds a wonderful flavor to our lemongrass-coconut steamed mussels. You can find Penn Cove and Mediterranean mussels in the local markets. They come from the clean waters around Whidbey Island and Quilcene Bay on the Olympic Peninsula. Both of these areas are in Washington State where the mussels are farmed off of floating rafts with ropes dangling into the water. Most of the mussels in the Pacific Northwest are farm-grown. The mussels’ beards, technically called byssus threads, are what connect them to the ropes. Both farmed and wild mussels have these shaggy beards, however, I am told that wild mussels do have larger beards. 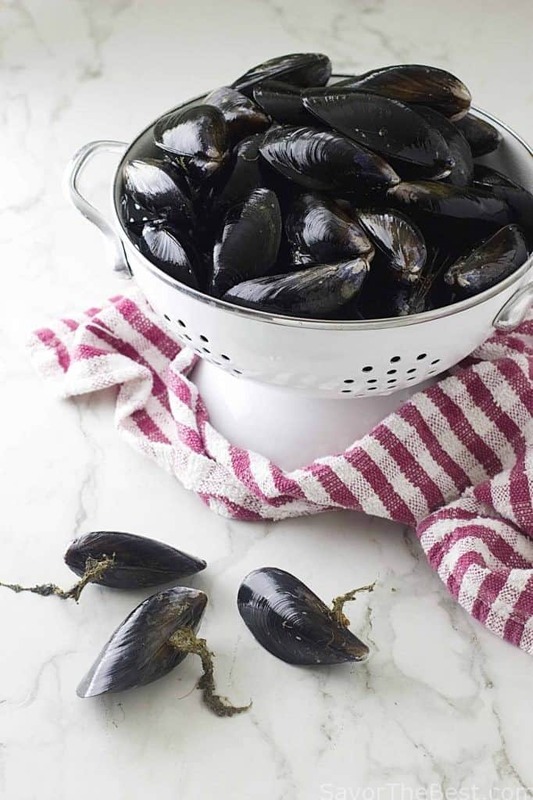 To clean mussels, first scrub the shells under cold running water, scraping off anything that is adhering to the shells. Discard any cracked or broken shells or any that do not close when tapped. The beard looks like an ugly chunk of seaweed stuck in the mussel shell. To remove the beard grab it and pull sharply toward the hinge. 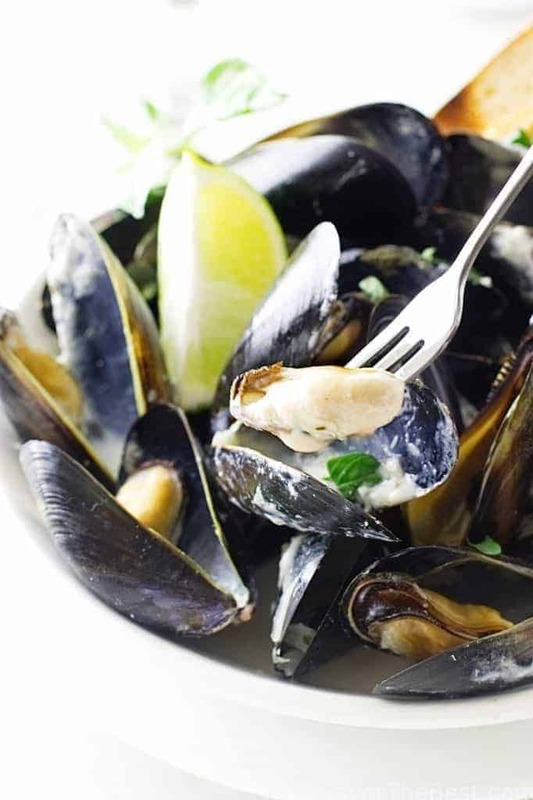 Mussels are relatively inexpensive, they have a complex flavor and a buttery texture. It takes a few minutes to scrub them and remove the beard but they are well worth the patience that it takes to clean them. 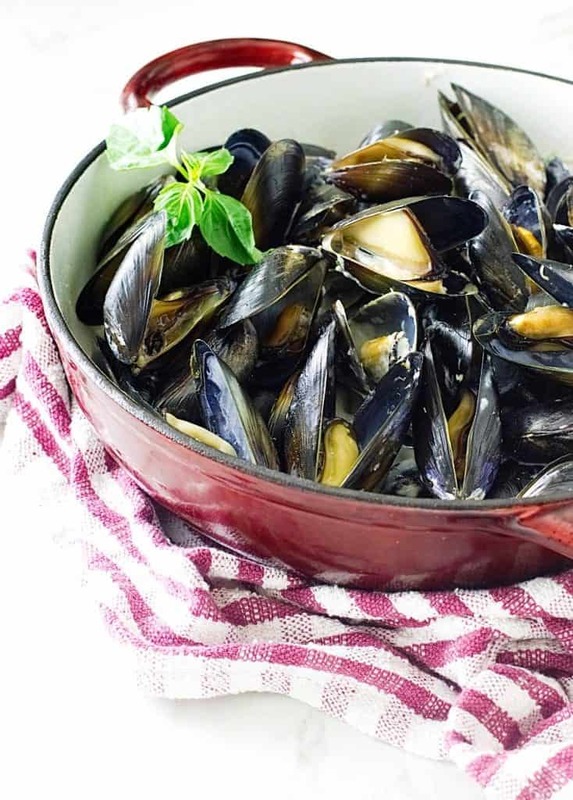 A big pot of steamed mussels will be a huge hit with your dinner guests. 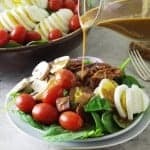 They are quick-cooking and delicious steamed in a rich flavorful broth or included in a seafood stew or served in buttered pasta topped with Parmesan cheese. We prepared this pot of mussels in a Thai-flavored broth of lemongrass, ginger root, shallots, garlic, wine, and vegetable broth. The mussels were added to this mixture, a tight-fitting lid was popped on the pot and the mussels steamed for just a couple of minutes. A mixture of coconut milk, lime juice, clam juice, and a little brown sugar was poured over the mussels. The pot was covered with the lid again and they continued to steam until they opened. We served these mussels in individual shallow bowls with a generous portion of the flavorful broth ladled into the bowls. It didn’t take long for those tender morsels to be devoured. Thick slices of crusty sourdough bread was served to dip into that amazingly delicious broth. Mussels are among the most flavorful ‘fruits of the sea’ and these Lemongrass-Coconut Steamed Mussels are plump, succulent and delicious. They are steamed in an awesome Asian-style broth of lemongrass, coconut milk and Thai basil. Serve with lime wedges and crusty, grilled or toasted sourdough bread. In a medium size bowl, whisk together the coconut milk, fish sauce, lime juice, clam juice and brown sugar; set aside. 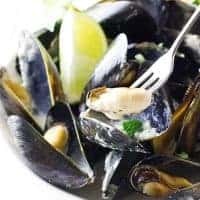 Using a lidded pot large enough to contain all the mussels, set over medium heat, add the oil and when it is hot but not smoking add the lemongrass, ginger and shallot. Cook, stirring often until tender and fragrant, about 2-3 minutes. Add the chopped garlic and cook for another 30 seconds, do not allow the garlic to brown. Stir in the wine and vegetable broth. Raise the heat to high and bring the pot to a boil. Add the mussels and cover with the lid and steam the mussels for 4 minutes, shaking the pot occasionally to redistribute the mussels. Remove the lid momentarily, and pour the coconut milk mixture over the mussels, sprinkle with the Thai basil and cover the pot again. Continue to steam the mussels, shaking the pot occasionally for another 3-4 minutes until the mussels have opened. Remove the pot from the heat and transfer the mussels to individual bowls. Discard any mussels that have not opened. Ladle the lemongrass-coconut broth over the mussels and garnish with fresh Thai basil sprigs and lime wedges. Serve with crusty sourdough bread and a bottle of dry white wine. When preparing the lemongrass I found that grating it on a microplane works rather well. We love mussels and we try different ways on how to prepare it. 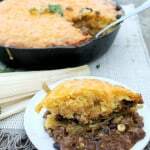 Luckily, we stumbled upon this recipe and it was so good. Everyone enjoyed it. Thank you for sharing. I love mussels and this is a great way to prepare them! 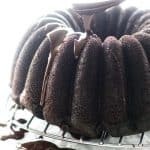 Excellent recipe, Pat! 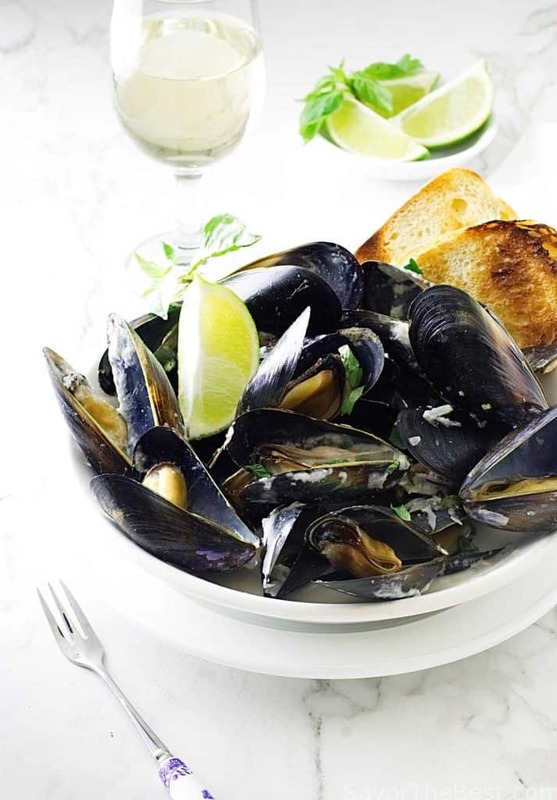 I love mussels, but I have never tried them with a coconut oil, interesting combination. I have to try this. Thanks for sharing. Thanks, John….Mussels really are wonderful and I am determined to buy them more often. 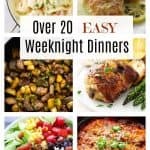 There are so many different ways to prepare them and they make a great first course or main entrée. You got me in the mood for mussels now! 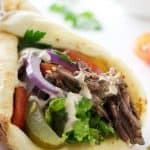 Love the flavors in this recipe! 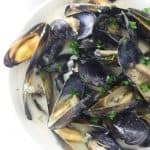 Mussels are cheap, delicious and relatively fun to eat: saline, mild and plump little bites. They are also extremely easy to cook, especially if they’ve been farmed (most mussels you find in markets have been). Just give them a good rinse, and they are ready to go. 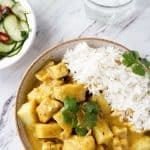 Here the treatment heads in the general direction of Thailand, offering a sauce of coconut milk, lemon grass, garlic and chiles that perfectly frames the sweetness of the meat.